This entry was posted on June 15, 2016 by Jessica Anderson. In this fast-paced, high tech time, it's refreshing to see a clock in a home or office. Summer is wedding season and it's always a challenge to find a meaningful gift for the bride and groom. Of course you can always choose an item from their registry, but sometimes you want to give something different, more sentimental with uniqueness and personalization, that they will cherish for years to come. Personalized Clocks make the perfect gift of time for newlyweds, along with couples celebrating anniversaries. When everyone has the time on their phone, computer, tablet, and Apple Watch, why would anyone want an old school clock? The answer to why a clock is a great gift lies in that very question. A traditional clock, once a staple in every kitchen, living room, and office, is now a rare sight in many homes. It’s presence on a feature wall or mantle is notable, distinct, and often a focal or conversation point. What makes our clocks special is they are both functional and beautiful. 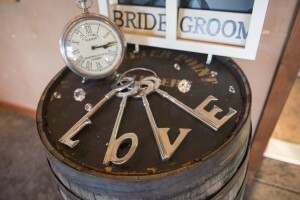 Custom clock engraving makes the clock especially personal and a reminder of their special day. The clock becomes a symbol of enduring love, an heirloom to be admired for a lifetime. This stunning crystal clock makes a lovely display piece. Our personalized clocks are masterfully crafted and precision engraved, sure to delight the couple. In a wide range of styles, there's a personalized clock in every price range. Below are some of our most popular options for a customized wedding or anniversary gift. 1. Our Gears and Cogs Personalized Clock is one of our best sellers, large, impressive and diverse enough to fit almost any home. With a modern design, skeleton face, and silver accents, this is a great choice for a young couple. 2. The Transparent Crystal Clock with Gears is a beautiful crystal showpiece sure to impress your couple. 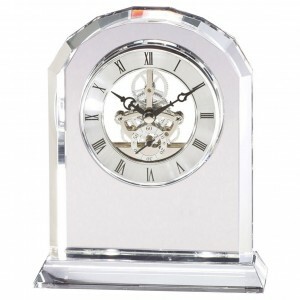 Again with the skeleton face, your personalized engraving is delicately etched directly onto the front of the clock. 3. For a couple who loves reading or academics, our popular Personalized Rosewood Book Clock is a great choice. With traditional styling, it looks terrific displayed on a bookshelf with a library. 4. Extremely affordable, the Silver Glass Personalized Alarm Clock is probably our best-selling clock. Under $25, with clean lines and elegant styling, you would never know what a great value it is! Just like every clock we offer, it includes personalized engraving for free. Our personalized clocks also make great favors for weddings as well. When I married years ago, I gave my bridal party each a small personalized clock to put on their nightstand or dresser to thank them for participating in our special day! Enjoy the festivities and a summer of love!